The all-new 4,680 sq. 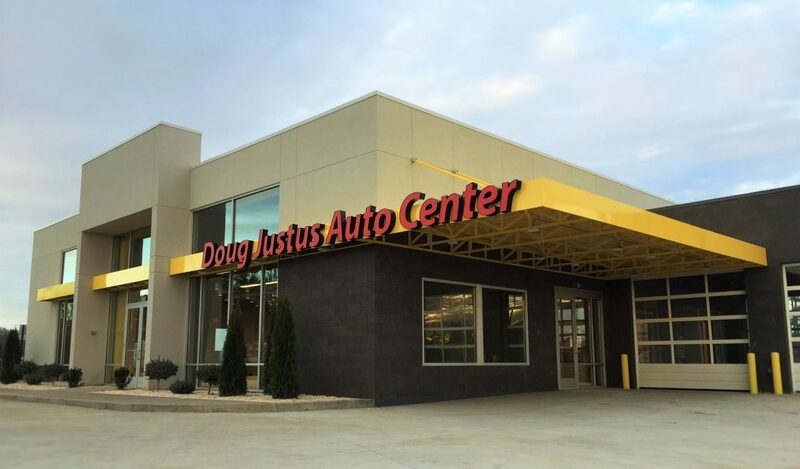 ft. Doug Justus Auto Center differentiates itself from traditional pre-owned automotive dealers by providing a contemporary interior and exterior design similar to the approach that many new, modern auto dealerships have embraced. KNOXVILLE, Tenn. August 23, 2016 – Doug Justus Auto Center, Inc., a Knoxville-based automotive dealership with a focus on providing quality pre-owned vehicles at a fair price has officially completed an all-new 4,680 sq. ft. automotive center. In partnership with Jenkins & Stiles, LLC, one of Knoxville’s top leading full service construction companies and Studio Four Design, a top architecture and design firm, the new modern-designed automotive dealership center is now open to the public. The automotive facility began construction in April and is conveniently located on Alcoa Highway at 872 Mimosa Heights Dr. in Louisville, Tennessee. The layout and design elements produced by Studio Four Design, were created with a focus on the automotive customer. The new facility differentiates itself from traditional pre-owned automotive dealers by providing a contemporary interior and exterior design similar to the approach that many new, modern auto dealerships have embraced. The center provides a state-of-the-art showroom, a comfortable and inviting lounge space for customers that offers stations for web browsing the auto inventory, and brand new staff offices. Studio Four Design and Jenkins & Stiles delivered a space with intuitive design that is furnished in a modern, yet functional fashion. The illuminated red letters against the bright yellow custom canopy at the front of the building fits the sleek design of the space and reflects the established Doug Justus brand. In addition to its eye-catching exterior design, the automotive center features a state-of-the-art interior, making use of natural light and modern interior design. Additional support for the project was provided by Prosim Engineering, as structural engineer; West, Welch, Reed Engineers, Inc., as mechanical, electrical and plumbing engineers; and Camel Canvas, as developer of the custom canopy. About Doug Justus Auto Center, Inc.
Doug Justus Auto Center is a Knoxville-based automobile dealership that specializes in Japanese imports and Volvos. Built on the belief that purchasing pre-owned vehicles should be simple, Doug Justus Auto Center employs non-commissioned sales staff to ensure the customer experience is pleasant and without pressure. With more than 300 vehicles in stock, the auto center offers a large selection to match customer needs with the appropriately priced and equipped automobile. Located on the Alcoa Highway Airport Motor Mile near the Pellissippi junction, Doug Justus Auto Center is committed to offering quality vehicles at a fair price. For more information on Doug Justus Auto Center, visit http://www.dougjustus.com/ or call 865-281-1540. In 2006, Jenkins & Stiles, LLC was established as a full service construction company to provide the highest quality commercial construction in today’s market. The company has built its trademark of providing quality commercial and specialty projects on time and in budget throughout the past ten years. Founded on the principal value of being customer focused, that purpose has driven the company to excellence in every aspect of its business. The company has completed projects in the following states: Tennessee, South Carolina, Georgia, Alabama, Virginia, Maryland, North Carolina, Kentucky, Ohio, Texas, Colorado, New York, Pennsylvania, Wisconsin, Michigan, Mississippi, Idaho, Washington, DC, and Nebraska. For more information on Jenkins & Stiles, LLC, visit http://www.jenkinsstiles.com/. Published on August 23, 2016 by Ripley PR. KNOXVILLE, Tenn. Aug. 18, 2016 – Studio Four Design, a leading architectural and interior design firm in Knoxville, has received the distinction of being named to Inc. 5000’s prestigious list of fastest growing businesses for 2016. The company has created a wide variety of challenging and innovative design projects for a number of clients while fully expanding its portfolio into a wide variety of industry expertise. Studio Four Design provides architectural expertise and interior design for commercial, higher education, industrial, religious, residential, and retail clients on local, regional and national levels. Recognition for the innovative design elements that the company brings to its clients and their ongoing growth has enabled Studio Four Design to be ranked at number 4015 on the Inc. 5000 list of fastest growing businesses. For design inquiries and to learn more about Studio Four Design and the company’s unique offering of architectural and interior design solutions, visit the website at studiofourdesign.com. Published on August 18, 2016 by Ripley PR.